James Phelps with Adam, Daniel and Victoria Johnson at Warner Bros. Studios. 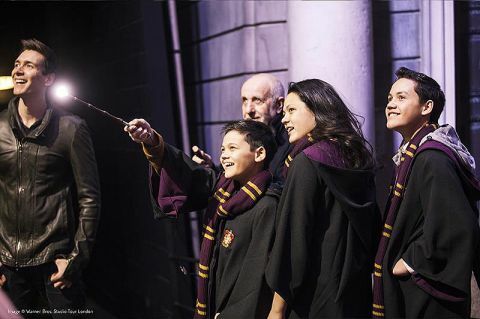 (NewsUSA) - Sponsored News - A Los Angeles family visiting the British capital was left amazed when they came face-to-face with actor James Phelps (aka Fred Weasley), who then took them on a one-off VIP tour of Warner Bros. Studio Tour London -- The Making of Harry Potter. Phelps, who played one-half of the Weasley brothers in the blockbuster movies, met the Johnson family as they visited the Warner Bros. Studio Tour London -- The Making of Harry Potter. The actor then took them on a very special tour of the studio. The family, consisting of mum Sam, Victoria (14), Daniel (13) and Adam (11) knew the trip involved a Harry Potter theme, but had no idea they would be embarking on a once-in-a-lifetime tour with one of the stars of the movie series. The Johnson family, which runs a successful LA-based charity that helps local children overcome bullying, were picked by the city's official tourism body, VisitLondon.com, for a special trip as part of the Fans of London tourism drive for the capital. Speaking about his day with the Johnsons, Phelps said: "I had such a great time with Adam, Victoria and Daniel, showing them around the film sets, telling them stories about when we shot the films and even teaching them a few magic tricks...London is one of my favourite places in the world and fans of Harry Potter can still enjoy so much of its magic across the city." "My mum used to read the books to me and my brother and sister even before we were born," said Harry Potter 'super fan', Adam Johnson. "When I think of Harry Potter I always think of London. Our trip was so much fun, especially meeting James Phelps, and I really wish I had a real-life Firebolt broomstick so that I could fly back to London whenever I want!" Fans of London celebrating the blockbuster events across London this year, such as The Queen's 90th birthday celebrations, 400 years of Shakespeare's legacy and the world's first exhibition on the Rolling Stones, EXHIBITIONISM. For the chance to win a trip to London, go to www.visitlondon.com/fans.